This November we go into our fourth year as the Dorchester Yoga and Therapy Centre with ever more classes being added to our timetable. As ever, the details are below and in the calendar – on our newly super-fast-er website – please check it! We are delighted to have Grace Martin back with us this month to teach her Thursday morning Pilates class. After retiring, she decided she missed it too much and wanted to come back. So for all of you who missed her too she is back on Thursday 1st November at 10:00- 11:00am. We would like to welcome Bridie Appleby-Gunnill who started three new classes in September: Somatic Flow on Tuesdays 12:15 – 1:15pm and Fridays 5:30 – 6:30pm, and a Woman’s Flow on Fridays 7:00 – 8:00pm. Read more about Bridie. 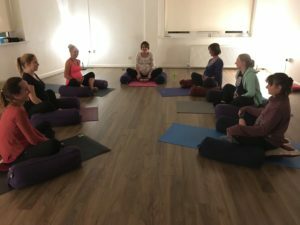 On Friday 9th Jez Culley starts the first of her twice monthly Rajadhiraja yoga classes. These are on Friday evenings 7:00 – 8:30pm on the second and fourth Friday of each month. On Monday 12th Robert George starts a weekly Guided Meditation Circle 7:30 – 9:30pm. We welcome him warmly to our cosy therapy room. And finally, Tuesday 13th brings us a new Vinyasa Flow class with new teacher Toni Roberts.